Here M is the Mach number of the encountering flow, and the relation is plotted in the following figure. 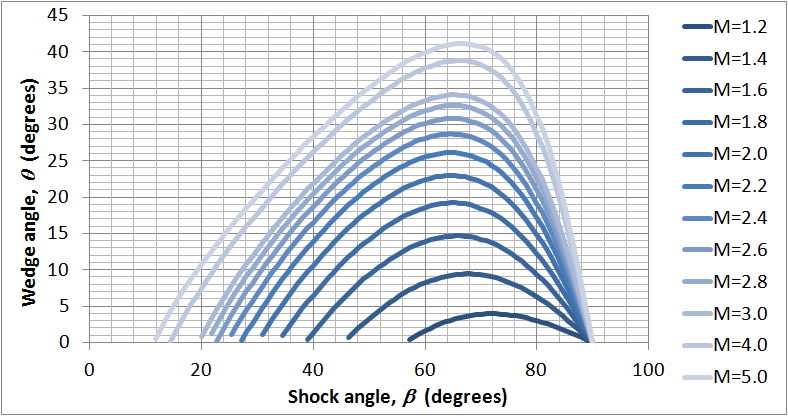 As you can see, for each wedge angle, there are two shock angles. 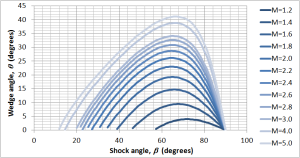 A shock with larger angle is called strong shock and smaller angle is called weak shock. In most of the cases, weak shock is prevalent (when Mach number goes from larger to smaller across a shock, the shock is weak shock). Using Flowsquare, such a supersonic flow can be simulated adequately. Using the input files (bc.bmp and grid.txt) below, you can simulate a following supersonic flow. If you measure the angles (β=47 deg and θ=15 deg), the difference from the theoretical value is within 1 degree! Mach number (colour and contour lines). Pressure field (p minus pres0).